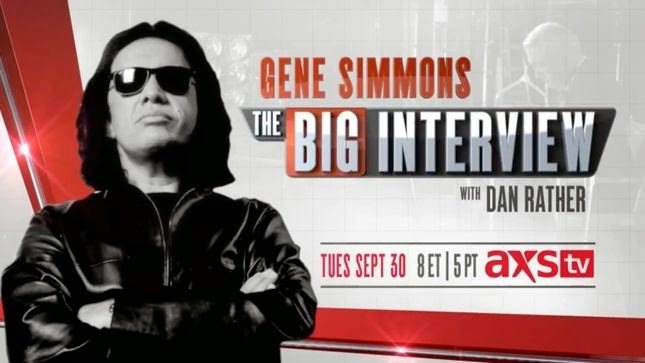 KISS bassist Gene Simmons sits down for an in-depth discussion with newsman Dan Rather on the latest edition of “The Big Interview” on AXS TV on Tuesday, and a preview of the show is available. Simmons discusses a variety of topics during the hour-long program, including his early days growing up in Israel, his move to America, and the father who abandoned the family when he was just seven years old, which inspired his decades-long fear of commitment and reluctance to have children. As expected, the bassist talks about the 40-year history of KISS, and his business interests, including his own record company, restaurant chain, race horse operations and an Arena Football team. "Gene Simmons has never been shy about delivering the straight truth as he sees it, and this episode of The Big Interview is no exception," said Michele M. Dix, AXS TV's senior vice president, programming and development. "But what sets this particular segment apart is Dan Rather's unique ability to dive head-first into his subject, setting the rock star bravado aside and cutting to the core of the man underneath the makeup and the carefully cultivated 'Demon' persona." The Big Interview with Dan Rather airs on September 30 at 8 PM EST/5 PM PST on AXS TV. Simmons and KISS will play their first Las Vegas residency this fall. “KISS Rocks Vegas” will see the band perform 9 shows at The Joint inside the Hard Rock Hotel & Casino between November 5th and 23rd. KISS are following in the footsteps of several other rockers who paved the way with successful extended Vegas runs, including Carlos Santana, Guns N’ Roses, Motley Crue, Def Leppard, Rod Stewart and Meat Loaf, among others.